When we first launched the Google Maps API, it was all about a map, a pin, and a dream. Back then our technical documentation was relatively simple, consisting of a couple of developer docs and some code samples. Since then the Google Maps API has expanded far beyond our expectations, due in large part to the diverse and innovative developer ecosystem that has grown with us. With the continuing evolution of the Google Maps API, it became clear that we needed more than just code documentation to convey what’s possible with the Google Maps API. Thus, developers.google.com/maps was born. 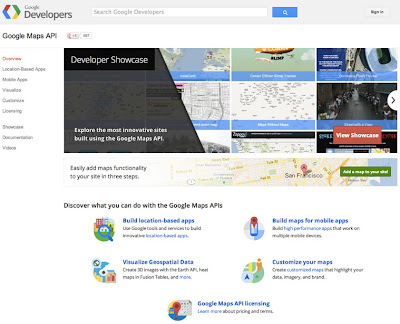 In addition to having all the same developer content that was previously available on code.google.com, the site is designed to highlight and illustrate new features of the Google Maps API through fun and interactive demos. Our goal with developers.google.com/maps is to inspire the next wave of innovation on the Google Maps API, and to connect developers and decision makers with the tools and services that can make their products better. One of the features of the Google Developers site we’re most excited about is the 3rd party developer showcase, which allows us to celebrate a selection of innovative sites in the Google Maps API ecosystem. 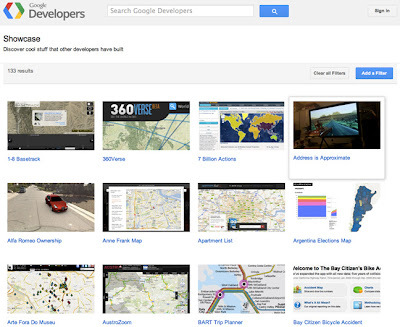 Showcase content is carefully curated by the Google Maps API team. In order to help users discover relevant apps and topics in the showcase, we’ve devised a tagging system that allows you to filter examples both by theme, and by Google Maps API features used. We hope that the showcase and the interactive examples on the new Google Maps API Developers capture your imagination and inspire you with what’s possible using the platform. The imagination of Google Maps API developers has always been what makes the product great and we’re looking forward to seeing what you come up with next. Carlos Cuesta is the Product Marketing Manager for Google Maps API. He also enjoys travelling, photography, and collecting vinyl.